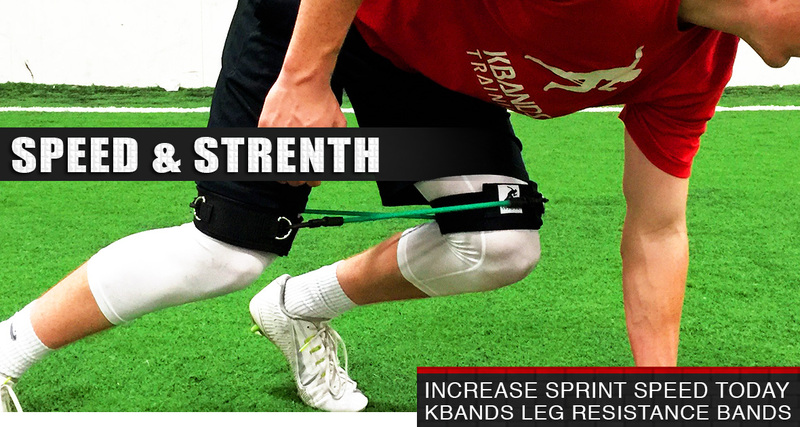 Kbands sprinting exercise bands are in essential training tool for serious athletes. If you are looking to improve your sprints, take a look at this hip extension sprinting drill. This drill is great for developing hip extension with power. The hips are very important when it comes to overall acceleration and sprint speed. To become an elite sprinter we must focus on hip extension. To begin get in a split stance with your Kbands on. Next, we will start with the Reverse Lunge Knee Extension. Sink down into your hips and then drive your knee up on the front side. This should be a seamless motion with no hesitation. From the reverse lunge position quickly drive the knee up, stabilize, and move toward your toes. Complete 4 to 6 repetitions of this movement. Now, switch to the other leg and complete an additional 4 to 6 repetitions. This phase of the exercise is our activation phase. Each repetition should be completed with power and proper arm action. As the knee raises in front, the opposite arm should explosively be pulled forward in a 90° angle. Stay consistent with the rear arm. Your rear arm should drive back with force building momentum for the next repetition. Now that we have moved through the activation phase, it's time to sprint a little with our Kbands sprinting bands. First, we will begin with your left leg forward. Load your body into your hips as if you are sinking down into a reverse lunge. This movement should mimic starting out of the blocks. You should be loading your hips with the momentum of your bodyweight going down. Build momentum with great arm action getting each elbow into place. Now that your legs are loaded, you will now explosively sprint out for 20 to 30 yards. Exaggerate explosion and arm action. Your rear arm must accelerate forward to drive your chest through the dig phase. The sprinting exercise bands will add extra muscle activation throughout your hip flexors. The Kbands sprinting exercise bands have many effects on your body. Throughout the beginning phase of sprinting, you will complete repetitions with more muscle activation throughout your glutes on your driving leg. You will also notice consistent hip flexor activation. The sprinting exercise bands will fire your hip flexor through every stride turnover. With more hip flexor activation you will increase speed during this drill. Stay consistent with your training utilizing Kbands and you will see the results. Throughout this drill you have now completed the activation phase, worked through some resistance sprints, and now it is time to unclip the resistance bands and finish up the exercise. We will be cutting down the unresisted repetitions, but your focus points will remain the same. Every repetition will focus on arm action, driving your knees up, and explosive push off your rear leg. Complete 2 to 4 unresisted repetitions of the Reverse Lunge Hip Extension Exercise. After you have completed both sides, move directly into 2 to 4 repetitions of the 20 to 30 yard sprints. You will notice when taking off the Kbands sprinting exercise bands your legs will feel like feathers. You will also have just completed many repetitions exaggerating the motions of your arms and knee drive. With the sprinting exercise bands off, we now can move through free range of motion. Utilize this feeling of complete muscle activation and move explosively. Focus on the mind-body connection and work at full intensity. Sprinting drills with Kbands should be completed 2 to 3 times a week. Just like other resistance training you have to let your body recover. Every repetition should be completed at 110% intensity. With this workload you will find great fatigue. There are several other drills that are great to pair up with this one before completing your workout. Check out the Kbands Wall Drill, Kbands Suicide Sprints, and Overspeed Accelerator Training Program for some great additions to your workouts.